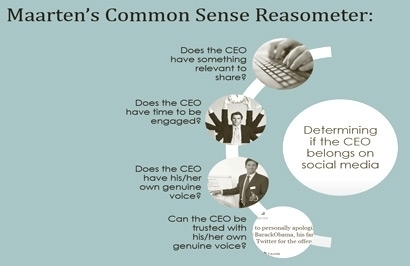 CMOs Just Aren't That Social -- And Who Cares? I wanted to react to Catharine Taylor’s recent column about the lack of social media activity by CMOs. She refers to Infegy’s list of the Top 50 most social CMOs in 2014, as measured by number of retweets, interactions, shares and so on. Catherine is not impressed by the fact that only nine of the Top 50 CMOs are from Fortune 50 companies. In other words, CMOs from big, well-known companies are absent in social media. But I say: Who cares? I cannot for the life of me recall an occasion where a tweet or Facebook status update from a CMO has pushed me to buy or try a product or service. Can you? Can any of your co-workers or family members? Anyone who is in line at Starbucks right now, as you read this? Go on, I dare you to ask if they even know the name of the Starbucks CMO. Or if they even know what a CMO is. Or does. In fact, some company leaders are celebrities: Your Mark Cubans. Your Richard Bransons. But most C-suite leaders are probably known within the industry they work in, but mostly unknown to the consumer at large. And that’s probably how it should be. 2. Does the CEO/CMO have time to be engaged? Let’s face it, one interaction a month does not cut it. So only join the bandwagon if you have the bandwidth to do it. And if the going gets a little rough, don’t go all silent on us, either. I am looking at you, @nflcommish. 3. Does the CEO/CMO have his/her own genuine voice? Don’t set up a Twitter account and then hire a PR firm or a junior digital marketer to tweet on your behalf. Are you listening, @SeppBlatter? 4. Can the CEO/CMO be trusted with his/her own genuine voice? This is perhaps the most important question. History is littered with examples of C-suite members going off the rails with rants, attacks and other stupidities that did more harm than good to their name and their business. Trump, Murdoch, Donald Sterling, Reed Hastings, Jack Welch, John Schnatter, John Mackey -- the list goes on and on. Think before you tweet! So join the fray if you must. But if you do it on behalf of your business, use common sense first, and then look to your humility and authenticity. 4 comments about "CMOs Just Aren't That Social -- And Who Cares?". Stephen Baldwin from Didit, September 22, 2014 at 2:27 p.m. Fully agree -- CMOs and CEOs are like rare ornamental plants that grow best in the cool shade. Too much social media sunlight tends to dry them out! Paula Lynn from Who Else Unlimited, September 22, 2014 at 7:26 p.m. If your CMO and CEO are spending hours on twits and fbeast, then either they don't have enough to do at work and the position needs to be refilled or they are not doing their job and ditto for their professional choice. The company loses supposed talent for which they paying the price. Kirk Tanner from Fishbowl, September 25, 2014 at 4:29 p.m. Unless you are famous, I think it is generally a waste of time and energy, especially if you have people within your organization doing social media for the company. I'm OK with testing it to see if you get any real engagement, but doing it just because someone says you should is silly. Too many of the executives that participate, do it because someone said they should, but aren't going about it right. They don't build communities that are relevant. Some buy their followers falsely thinking that they are now successfully doing social media. Most don't track any stats worth tracking, and most don't post relevant content that helps generate leads, interest or sales. What you end up with is a bunch of noise around your brand with no value. Some actually do more damage than good. If you choose to engage in social media, I highly recommend using and expert advisor so that at a minimum you don't damage the brand you are trying to build. Cathy Taylor from MediaPost, September 26, 2014 at 12:48 p.m.
For obvious reasons, thought I should weigh in here. I never suggested that CMOs should be in social media to sell product; rather it's to be familiar with the platforms where their customers are, to understand how to use them. Nor did I ever suggest that they spend all day long on Facebook. Here's the thing: if you had a CMO from a major brand who bragged about not owning a TV, you'd probably fire them. How could they do their job without watching a medium where they spend so much money? It's the same reasoning. Almost eight years ago, I was asked to write a feature story on Facebook. People I interviewed were talking about the News Feed and other aspects of it, but at that time, barely anyone from my demo was on it. It became clear to me quickly that the only way I was going to understand what the hell people were talking about was to join, and though my experience there at that time was limited at best because practically none of my friends were on it, I had to be there to get it at all. CMOs should feel the same way.